Generally two weeks after Semana Santa and everyone has had plenty of time to rest after a week of eating, drinking and of course the crowds. All this while contemplating Jesus and the Virgin Mary. How do you recover from the madness of Semana Santa? Blow off a little steam with a week of eating and drinking, crowds...then add dancing, toros and cheap carnival rides in place of all that religion! The Feria de Abril is a great time to see what many consider the typical Andalucia - sherry, Sevillanas, toros, flamenco dresses and horses. Giving the people who live in the center a break after trampling through their streets for a solid week, the Feria takes place on the other side of the river and breathes a little life into Los Remedios. Below I've tried to offer a brief guide to the Feria, including a little background, what to expect and how to enjoy it. The Feria is not for everyone, and deciding on whether to attend during the night (party time!) or day (horse and children time!) can significantly change your opinion of the event. If in doubt, try a day time trip one day, then get some rest and try the night on the following day. What is the Feria de Abril? In 2010 the Feria de Abril will be the week of April 20 - 25 (keep in mind the date each year is always tentative until sometime around December when the Ayuntamiento proclaims it official). The Feria de Abril has a longer history than what you may read. The "modern" Feria was started in the Prado de San Sebastian as a cattle fair in the late 1840's. Before these times a cattle fair was held at the Cruz del Campo, which is now on Avda. Cruz del Campo next to the cerveza factory by the same name. The fair grew in size and eventually the people were more into celebrating than purchasing a certain number of heads of cattle. In 1950 the celebrating and cattle parted ways and the Feria as an event evolved into more or less what it is today. In the early 70's the event moved to the grounds on the edge of Los Remedios where it is held today. The size and attraction of the fair has grown considerably and there is now talk of moving it once again to Charco de la Pava where there is yet more space. That decision may be made in the next year, but it may take longer to actually move the Feria to that location. In my opinion it would be a shame to move it further away from the center. With more and more people wanting to lay down some cash for a private tent the Feria grounds have proven to be small. A private tent is a status symbol, and the smell of money may lead to a change in venue. The Feria is essentially a small city erected for less than one week. Over a month ago we stopped by to see the main gate almost finished, so work begins well before Semana Santa. In the "spirit of Los Remedios" (I'm kidding a bit on this one) it is set up in a grid with rows of casetas or square tents lining the streets which are named for famous bullfighters. 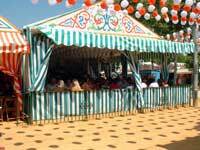 There are of course places to eat, and a section of the grounds with rides and games. 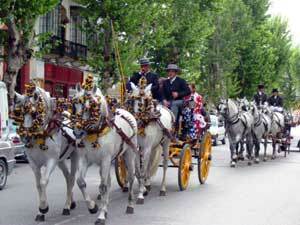 The afternoon is the time to see horses and most of the traditional dress of Feria goers. The night is the time for drinking and dancing until the sun comes up! As with all fairs almost anywhere in the world expect higher prices for just about anything including things outside of the grounds like hotel rooms and taxis. And while May is technically still spring, and a wonderful time in Sevilla, the end of Feria seems to mark the beginning of summer. This changes a bit this year with the early arrival of Semana Santa and thus the early Feria de Abril! 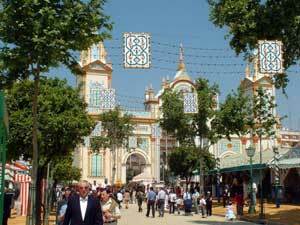 The Feria de Abril officially opens on Monday/Tuesday morning (at midnight) when the puerta is illuminated (el alumbrao). Fried fish has become a traditional meal on this night. Wasting no time the people enter just after midnight and the festivities begin. On the following Sunday Feria closes at midnight with a fireworks display. Depending on your location, the weather, and your roof-top terrace, you may be able to catch a glimpse from afar. There is some good food to be had at the Feria, but the prices tend to be expensive and your choices will often be more limited than your average restaurant in Sevilla. Expect plenty of cured ham, sausage and the like. Also typical is seafood and lots of it. If you plan to eat a meal be prepared to part with a decent sum of money for sometimes average food (Some places are quite good). In the early morning after a night of drinking you'll likely see people gathered on the corner of the Triana bridge eating churros y chocolate. Feria is two different experiences depending on which you select. The day is the best for seeing the horses -and there are plenty of them. Those riding horses or being pulled in horse-drawn carriages are typically in traditional dress. You can rent a carriage at this time, although it is quite expensive. The day is also a good time to eat and take in the scene with a crowd that varies in age. You'll get the best pictures as well. People are more laid back and there's less rowdy behavior in my opinion. Night is for drinking and Sevillanas. And there's a lot of drinking going on - fino and manzanilla are consumed in large quantities. The crowd is younger and many don't start their time on the grounds until midnight after having hit the bars close by or in the center. The lights go on and anyone visiting should try and at least get a glimpse of the main gate, or puerta, at night during some point during the week. If crowds are not your thing the day may be better, but still expect a crowd! The casetas are typically set-up and run by associations, private groups and companies. What you can't do when you get there is enter most of the tents or casetas, as many are private and require a previous invitation. A few community and other tents are open to everyone and are free of charge. You may have some luck if the guy at the front of the caseta is nice and lets you in, but don't count on it. Having a caseta for Feria is a sign of wealth in most cases - you put it up and pay for it and then invite all your friends and anyone else you may want to impress. 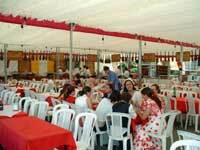 The Feria does not take place in the center, but on the other side of the river in Los Remedios. Depending on where your hotel or apartment is you may be looking at a 30 minute walk or more! That's fine as your making your way there, but keep it in mind on your way back. While I won't give directions it's easy to find - cross the bridge to Plaza de Cuba, keep going straight a few blocks and then take a left. You'll eventually run into the grounds. If you've been to a state fair in the U.S. then your all set! With all the pictures you see the horses, dresses and casetas. You generally don't see all the carnival games and rides which are part of the scene. Take a trip down the appropriately named calle de infierno, or "road from hell", where you can get your fill of hastily constructed rides balanced on wooden blocks, the typical "rigged" carnival games and of course cotton candy and the other foods which don't mix well with the rides. There's plenty of music and dancing going on and many visitors remark about all the flamenco music and dance. But it's almost always Sevillanas that they're seeing and hearing. Sevillanas is a variation of flamenco but not the typical kind. There is a difference in the timing, rhythm and style of singing and the locals are specific about calling it Sevillanas, not flamenco. It may seem that every sevillano is born with the ability to dance Sevillanas - almost all know it to some degree or another. Tourists, crowds with people squeezing by, lots of cameras and of course money for the day in the street, all make the Feria de Abril an ideal place for pickpockets and the like. While I’ve never had a problem, many do – keep your belongings close to yourself and never take your eye off them. Funny, all I had to do was change Semana Santa for Feria de Abril in this section! Feria would not be complete without a bullfight or two every day. Considering the names of the streets in the Feria grounds and the origins of the event, the bullfight plays an important part in the overall festivities. After Semana Santa the schedule goes full steam with a corrida every day until the end of Feria. 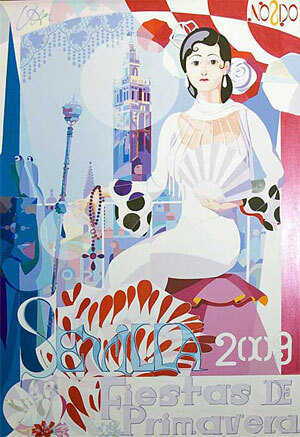 But the Feria de Abril sees some of the best action and most famous toreros. If you don't get in to see a bullfight during the week it's interesting enough to pass by the Plaza de Toros after the event to see the horses and carriages as they take people to the Feria across the river. The bars in the Arenal, the neighborhood surrounding the Plaza, should be crowded and offer plenty of action before and after the corridas as well. Below is a schedule for the week of Feria 2009 and note that tickets are hard to come by. Check at the Plaza de Toros itself or try your luck and pay a higher price at the office on Calle Tetuan which sells tickets to many events. 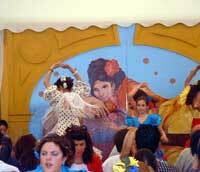 You can check out some of Feria de Abril 2003 with the photos provided by Dave Barlag. He was kind enough to send some along to me after having missed the event last year. 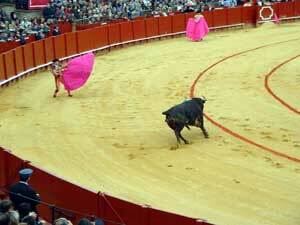 And of course Feria means toros with a bullfight everyday!